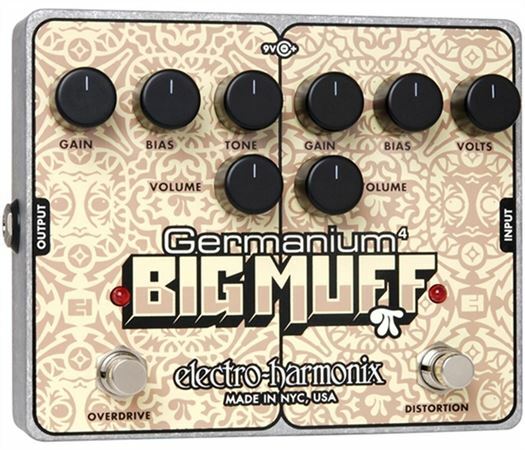 Shop Electro-Harmonix Germanium 4 Big Muff Pi Distortion Pedal from AMS with 0% Interest Payment Plans and Free Shipping. The Electro-Harmonix Germanium 4 Big Muff Pi Distortion Pedal combines four classic germanium transistors that provide incredibly rich analog overdrive and distortion tones that can get out of this world. The Germanium 4 Big Muff Pi’s two sides, overdrive and distortion, each have their own sets of two germanium transistors as well as independent controls. Electro-Harmonix designed the pedal with the ability to stack and use both the overdrive and distortion together for huge flexibility and tonal options. Wow, this thing sounds great and is super versatile. It is NOT a FUZZ pedal so don't be fooled by the Big Muff name. It does killer Distortion and Overdrive rock sounds. Those looking for the heavy but sweet germanium diode sludge this is it. Plus the duel modes, this things a steal.